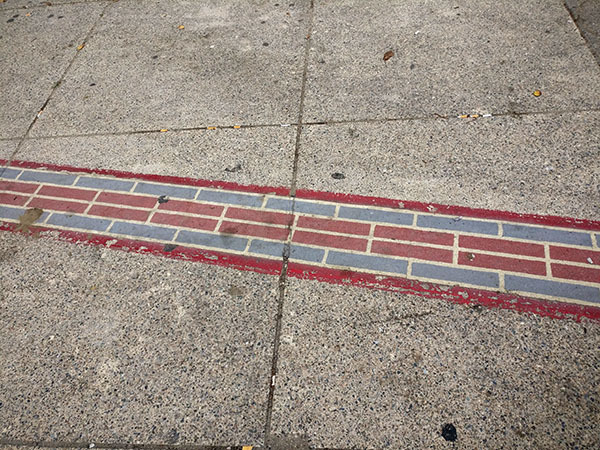 Stretching throughout the city of Boston and across the Charles River Bridge is a conspicuous brick path winding through the center of the sidewalk. 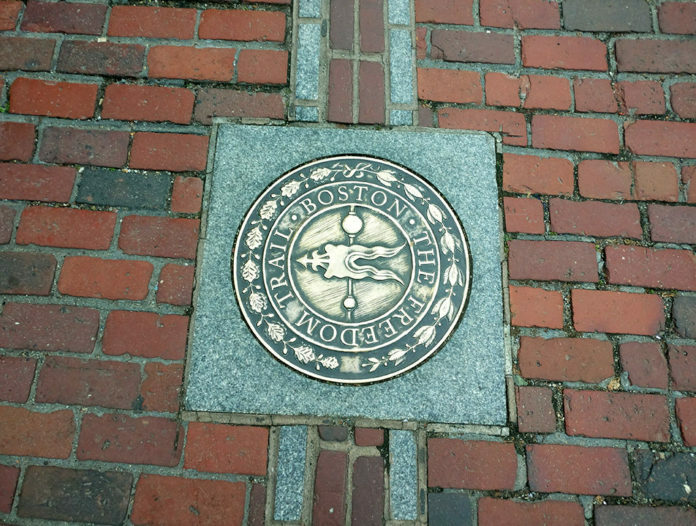 This is the Freedom Trail. It doesn’t require a map, or a how to guide; it’s easy to follow and impossible to miss. It charts the course of the early settlers of Boston and the historical monuments that create the blueprint of what turned America into a republic in 1776. I don’t know what kind of public school I went to, or if I just wasn’t paying attention, but I thought America already split from London before Boston was founded. So it was news to me when we started our world school lessons on Boston prior to our visit. Yes, that’s my one embarrassing thing this post. Please, don’t tell anyone. The starting point for the Freedom Trail is Boston Common. Boston Common is a huge 50 acre park. Coming out of the subway exit on the red or green lines, you’ll see a small building with a round dome roof. You can’t miss it. This is the Boston Common Visitor Center. You can’t drive the trail, so don’t even think about it. Inside you’ll find restrooms. Traveling with a family, a family with young kids, we definitely recommend going before you go. 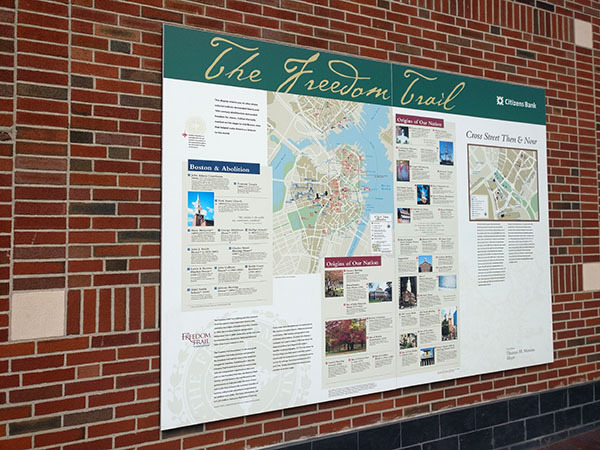 If you plan to walk the tour self guided, you can purchase a map, booklet, or leaflet here with additional information about the Freedom Trail. It’s not required or necessary. There is plenty of information at each stop, but there is only so much you can print on a placard. These guides give you a lot of additional historical information – plus it can serve as your book of the trip selection! Inside the visitor center you also choose from a selection of Freedom Trail magnets to take home with you. This is also the meeting place if you’ve hired an old timey guide. They are easy to spot, standing outside wearing period clothes and wigs from the 1700’s and holding a large pole, or a lantern if you hired an evening guide. Alternatively, online you can purchase and download an auditory self-guide containing three hours of narrative complete with sound effects, ambient noise, and music. Take your pick; we went with the self guided tour and purchased The Complete Guide to Boston’s Freedom Trail by Charles Bahne. You either want to get started early, or plan two days along the trail. Honestly, do both. Each stop requires a minimum of a half hour, plus time for snacks, lunch, potty breaks, and play, and most of the indoor sites close by 5p. A great lunch spot is Chicken & Rice Guys eight stops in, and you have to stop for cannoli in the North End – we prefer Mike’s Pastry. Lastly, we recommend going on a DUKW tour before the Freedom Trail to get a lay of the land. 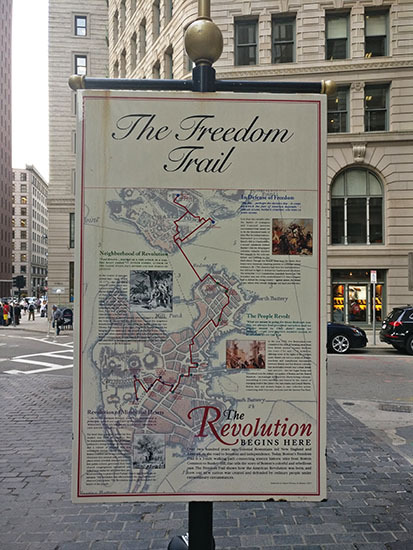 The Freedom Trail covers a lot of Boston History in a condensed space in an even bigger city. It offers permanence, perspective and clarification on a lot of questions that came up during the tour. Plus, you’ll see what is nearby your stops on the trail giving you a chance to plan out your day and activities better. ► For Kids: Hands on learners will thrive on the Freedom Trail. Not only can you fixate the time, the place, and the surroundings with the actual event, but you can step inside and see the way that things were and how they happened. Auditory, Visual and Reading/Writing type learners will do great on the Freedom Trail as well. There is a wealth of information contained in these 2.5 miles and there is a lot to discover. Our twins were 6 ½ at the time we visited Boston and it was a great age to start unwrapping the complex ideas of why we needed freedom from England, what taxes should and shouldn’t be used for, and how ideas and facts alike can be distorted and manipulated. 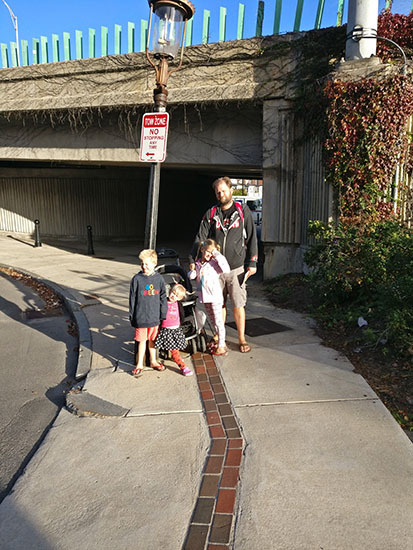 Our three year old had a great time balancing on the trail in the sidewalk and making sure she knew which direction it was headed. While she may not have grasped all the historical significance, since most of the day was spent moving and sampling food, she enjoyed herself. Plus, I think she hears more than she lets on. ► Nap-Time Version: The answers to all the big questions you have about touring the Freedom Trail. Family Hint: There’s nothing to it.